The Boudoir Bash didn't take off, am I distraught about it? Absolutely it's an art form that shares multiple forms from intimacy to appreciation. I'll orchestrate another event sometime in the near future and approach it in a more unique manner. I've got a few private sessions but I felt slightly shot down when I coordinated with the hotel and management for the event, hired talents to provide their services so that the women and men could feel like they were truly royalty. However the weeks leading up to the event things came up for multiple participants and the number of participants 4 days before the event fell to 6. It's not about the money for me but I just couldn't justify utilizing an entire day for two women and have them walk away with what I felt was less than they both deserved. I'm doing a few private sessions which wont have champagne or cupcakes or the lavish set up that was anticipated however I can still deliver stunning works of art that cross from my visions into the index finger of my hand as I apply pressure to the shutter. I will change the tone and get positive as January is rapidly coming to an end and February will be greeting me with my 25th birthday among many other things. At the top of the list is the joy of becoming employed once again as I'm eager to have something to look forward to once again and what is before me is a job in which I am already adamantly passionate about. Once things are finalized I will announce the news but for the moment it shall remain a secret! Im heavily anticipating this year's Iowa State Fair as I will be participating in the Photography Salon once again. A few unique things about this year is that all entries must be in black and white. A category for film has been added, and this year participants may enter up to 5 images. I typically never photograph in black and white however the A7 has a black and white option and it helps me visualize what I'm trying to truly capture. It's still a little colder than I would like it to be but I'm making mental notes daily to calculate what I need for my entries. As for the 5 classes I'm considering I still haven't made the final decision there but last night while I sifted through some photos that I had taken last year one instantly spoke to me. 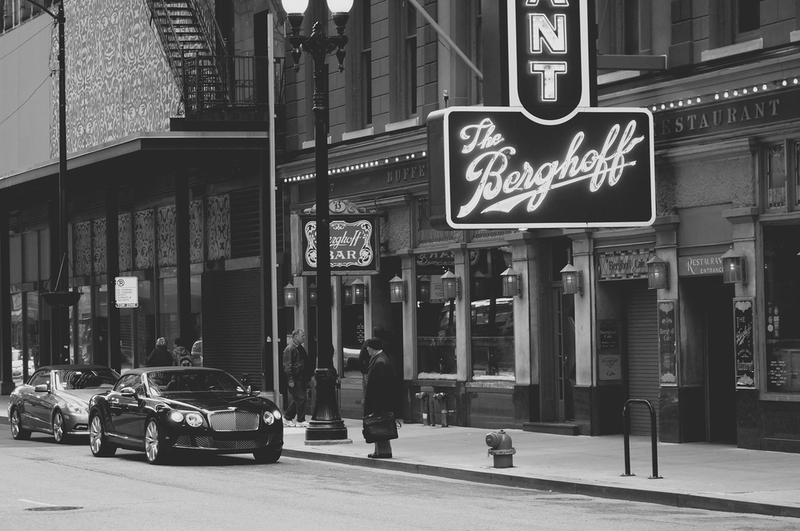 The title for the image came to my mind immediately, Old Vs. New - I wasn't aware at the time but the Berghoff Restaurant is a historical piece of Chicago located on Adams Street. It has gone unchanged since the 1950's, and the bright sign can't be missed! I was walking to the giant bean to do what any tourist to Chicago would do. Snap photographs of it and admire my own reflection! I quickly observed the Bentley Continental GT with it's hazards on as if the owner of the vehicle was inside enjoying lunch. I paid no attention to the situation, simply admired the luxurious car as I continued walking in the frigid temperatures. It was just before I turned my head and kept walking that an elderly gentleman exited the restaurant and stopped to admire the beautiful vehicle with his briefcase in hand, dressed from head to toe in black. For this moment in time the young and the old glance at one another in a historical part of Chicago. I will slowly assemble a folder of images to consider for entry with hopes of placing this year. Last year I walked away with one photo on display out of three entries and it received an honorable mention. I'll keep you updated with the progress as June and July get closer. Lastly personal well being, I'm no stranger to eating unhealthy items, having ice cream for breakfast, or just not being active. 2013 was a dreary year for me, I sat in a surveillance vehicle for a majority of the year either performing my job or driving anywhere from three to sixteen hours to work. I ate horribly and was beyond sedentary. It was difficult eating healthy at 5 in the morning. Yesterday I met with a talented young man who is bringing new life to yoga and not only the importance but impact it can have. Matthew Koder not only instructs yoga but lives it, he managed to express such passion that I was overwhelmed with excitement. We discussed potential collaborations and ideas that we both agreed have huge potential. I also agreed to start practicing yoga with his guidance, I will document my progress and look forward to greeting everyone with a healthier me both internally and externally. Too often I managed to make excuses for going to work out. Despite half of my Facebook timeline being consumed with people posting pictures in gym mirrors flexing. I'm not doing this for facebook likes but rather buying the time I have on this earth and with the mediums of photography and video.